They are used in warehouses and factories for moving items to and from storage, they are used in shipping yards for product handling and they are used in countless other applications that involve the transportation of goods. 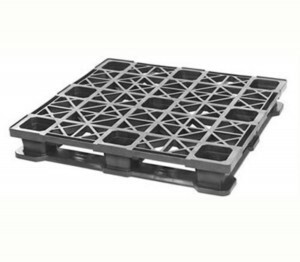 Plastic skids and pallets are characterized by their partially hollow interiors, which allow for hi-lows, forklifts and other mobile lifting machines to move pallets and their loads from one area to another. Because many mobile lifting machines’ lift capacities reach or exceed 4000 lbs., pallets offer the opportunity for the large scale, efficient transportation of items. Plastic skids offer many advantages over wooden skids, not the least of which is that they can be approached for lifting from all sides (most wooden pallets can only be approached from two). Plastic skids’ durability compared to wooden skids makes them a much better choice for companies that have access to them. Also, wooden skids, especially when stored near each other, pose a very dangerous fire hazard. Plastic skids can be engineered to be fire resistant. 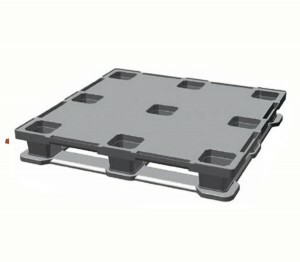 Most plastic skids are rackable, stackable or nestable for easy storage. Because they are designed to be durable, most plastic skids can reused and recycled. Many distribution companies even make customers provide a deposit when products are shipped with plastic skids to ensure that they will be returned. Despite being plastic products, which in many cases contribute to environmental degradation, plastic skids are a sustainable shipping solution because of their long operational life and the fact that they can be reprocessed. Many plastic skids are made from high-density polyethylene, which gives the skids their sturdiness. Like many other plastic products, plastic skids are molded or extruded. There are six plastics processing methods by which a given plastic skid can be made: injection molding, compression molding, rotational molding, profile extrusion, thermoforming and structural foam molding. The most common fabrication method is injection molding. In injection molding, a raw plastic material is heated to a liquid state in a conveyance channel and then directed into a mold. The mold is a tool designed in the shape that the final skid product is intended to take. The liquid material conforms to the contours of the mold, and then after it has cooled the skid hardens and takes its final shape. Plastic Skids Plastic skids are plastic pallet bases that are used for the transportation or storage of materials. Pallets are used to transport all kinds of materials all over the world.